Other heat presses cost at least $500+. This is bare basic all manual 6 ton table top heat press. 3" diameter 6061 aluminum plates. Simple dial controlled 250 watt single heated top plate reaches 250 degrees in only minutes with digital temperature gauge. 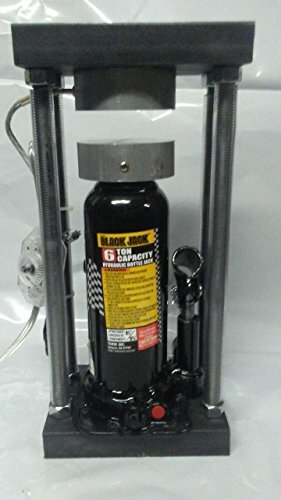 The hydraulic bottle jack is rated up to 6 ton or 12,000 lbs of actual force makes 1,697.5 psi at the plate! Only weighs 15 lbs. Small footprint only 14" tall, 6" wide and 4 " deep. Built to last all steel construction. Comes completely assembled ready to press! If you have any questions about this product by 6 Ton Personal Heat Press, contact us by completing and submitting the form below. If you are looking for a specif part number, please include it with your message.